I had a tough time choosing a book and actually began reading three of them before settling on one. In the end I chose The Charm School by Susan Wiggs, a book first published in 1999. This historical romance has been in my TBR since November of 2011. How did it get there? JenM mailed this book to me after she recommended it while commenting on a post. 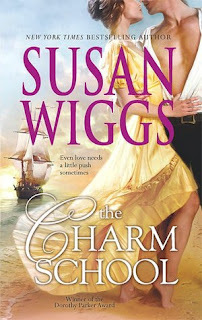 I mentioned that I had never read a historical romance by Susan Wiggs, only contemporaries! Thanks again Jen! Isadora Peabody is an awkward misfit in her beautiful and accomplished family. She turns from the polite Boston society of 1841, taking a job as a bookkeeper on Captain Ryan Calhoun's ship, "Silver Swan." Sailing to Rio de Janeiro, Isadora discovers not only adventure on the journey, but passion and friendship. The Charm School by Susan Wiggs is a great example as to why a book should never be judged by its cover, or its title. I've seen this book around countless times, and I've passed it by without ever reading the blurb. Mostly because of that title, but frankly the cover didn't help either. No kidding. In The Charm School, Susan Wiggs brilliantly reworks the 'Ugly Duckling' fable into a romance. Izzy is the plain, dark and socially awkward ugly duckling in a family of beautiful and socially adept parents and siblings. Her journey from that ungainly, plain, and insecure person is helped along by the reluctant, handsome and roguish Captain Ryan Calhoun of the Silver Swan. Ryan resents the way Isadora gains a position as translator in his ship, and that she will be a part of his crew during the voyage to Rio de Janeiro, but he figures he'll make her pay while teaching her a lesson or two along the way. Neither Ryan nor Isadora knows that on their way to Rio they will find friendship, passion, love and more. This romance surprised me with its charm and unexpected turn of events. 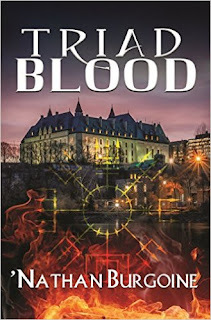 There are two reasons to love this novel: Isadora's character growth from beginning to end is measurable, and Wiggs develops the romance between Isadora and Ryan in increments until it is believable to the reader. Additionally as interesting plotting points, Wiggs incorporates some serious pre-Civil War subjects and dark moments into the characters' present situation and background histories, while using humor and excellent dialogue to give the story an unexpected light and fun atmosphere. Isadora and Ryan are both memorable characters. Isadora because of the slow transformation she undergoes from the unattractive and prissy self-proclaimed spinster into a beautiful, confident and smart young woman, and Ryan because of the way he appreciates Isadora's qualities and pushes her to acknowledge her strengths. I love the way their relationship goes from enmity to a bickering, almost reluctant friendship, and from a surprising attraction to passionate love. I was further surprised by where this book got its title, The Charm School. I don't want to give it away, but those scenes on the ship were some of the sweetest in the book. I mean, really! There are some great secondary characters in this story. Additionally, this book has the distinction of being the one and only historical romance I've read where the heroine loses her virginity while both protagonists are high on hemp! That was an unforgettable scene. "Isadora, I adore-a." Somehow Wiggs made it work. Of course there's some expected drama before the happy ever after, and although the ending is a bit over-the-top (no question about that) I think it is appropriate for this story. This pre-Civil War historical romance offers a sailing adventure that takes the reader from Boston to Rio de Janeiro, and through Virginia. I enjoyed the journey, but most of all I love that in the end I finished the story with a smile on my face. I'll be reading the second book of this series, The Horsemaster's Daughter. This one was a keeper for me when I first read it, although I will admit that I actually prefer The Horsemaster's Daughter. It's a wee bit "darker" and a bit more "angsty" - which I tend to be a sucker for in historicals. And in true Wendy fashion? The rest of the books in this series? Languishing in the TBR. Ugh. Wendy, this one is a keeper for me now. I already have The Horsemaster's Daughter in my TBR, and after reading this one, I hope to read it soon. I'm curious about the setting in Virginia and Ryan's brother. Hilcia, I'm so glad you liked it, and that it finally made it's way to the top of your TBR pile! It's so hard to find books set in that time period. Wow, this books seems to be interesting. Next time I'm buying books, I'll make sure to get this one too. Oh yes! I recommend it, I think you would enjoy this book. Let me know what you think! I loved this one, but didn't get through either book 2 or 3 of the series. Gave up at that point. Ohhh, Im going to try the second book to see how it goes! I hope it works for me. :) This book is a definitely winner, though. Great review Hils! Ugh, I know I have the book in my TBR pile, but I can't remember whether I've read it or not. I'm guessing not, since I don't have much of a recollection. And you know, the cover you currently have is a new cover. I'm betting Harlequin wanted to attracts more readers, so gave it a pretty cover that might not have much to do with the storyline. ah well, this one is coming with me to QC this week-end :) Thanks for the review and so glad it was a winner! Frankly, I misinterpreted both the cover and the title. I thought this was about some Victorian missy from a group of girls that made up a "The Charm School" who got caught up by an English Lord/pirate on the high seas... or something like that. I NEVER even read the blurb because of that title! But oh well... now I read it. I've had this one in my tbr pile for ages! I read the Horsemaster's Daughter but not this one. I like sea-faring romances so I'm definitely going to pick this one up. Great review!